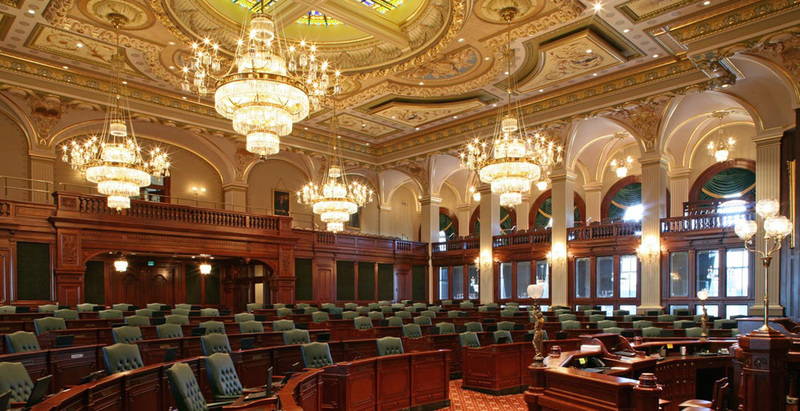 Originally completed in 1887, the Illinois State Capitol had been subjected to numerous renovations over the years that detracted from its nineteenth century grandeur. Renovation work for both chambers included construction of period-accurate chamber desks, restoration of original millwork, including speakers, podiums, press boxes, elaborate paneled doors and glazed side walls. Restored interior finishes included plaster moldings, etched glass, decorative painting and marble bases. Historic light fixtures and carpets were recreated from historic photographs. Seamlessly integrated with these period finishes are state-of-the-art audio and video, voting and data/electrical systems. We provided construction administration services and owner's representation to ensure the project met CDB guidelines, budgets, schedules, and neighboring occupancy restrictions.